...to nurture our faith through prayer and bible study. ...to support the mission of the Church worldwide. ...to work for justice and peace. Meetings: We meet at 12:00 Noon in Friendship Hall on the 2nd Saturday of each month for lunch, a meeting, and the Bible Lesson. Individuals help serve and clean up tables. Bible Study: Horizons Bible Study - The current Horizon Bible Study is "Cloud of Witnesses," The Community of Christ in Hebrews, by Melissa Bane Sevier. Forgiven and freed by grace through faith, the central figure stands in praise. Rooted in faith, the trio of women emerge. The outline of the central figure forms a cross. We are Presbyterian women engrafted in Christ by the power of the Holy Spirit. It is no longer we who live, but Christ who lives in us. The right figure holds a book to guide her reading, studying, praying, or meditating. The left figure reaches out to care for others, as she shares, nurtures, and heals. The circle represents the church worldwide where women offer their gifts and talents in the midst of the global community. The uplifted arms of the central figure reach out to embrace a just peace. The relationship between the three figures depicts lives of wholeness rather than turmoil. The three women have no distinct features. They represent all women. The shapes surrounding them express energy, strength and openness. Our name, Presbyterian Women, ties us to our denomination. The Bible resembles the Bible depicted in the PC (USA) Seal. 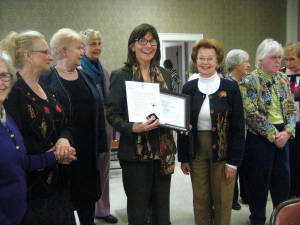 Beth Stone spoke at PW Lunch Circle and was presented with an Honorary Life Membership. 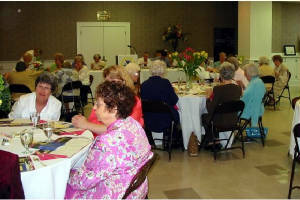 Women enjoy visiting at our annual PW Birthday Offering Luncheon. Presbyterian Women: Many thanks to the women of our church who sewed curtains for a cabin at Bluestone Camp and Conference Center in support of the PW of the Presbytery mission project. 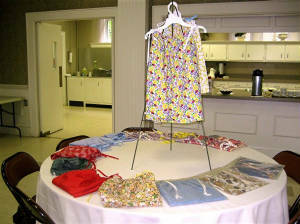 The fabric was purchased at Best's with money from our PW Circle pledges. Those who worked on the curtains were Kay Hoover, Jane Beaver, Marcy Fairlie, Martha Hall, Ann Harkins, Dottie Keesee, and Jo Voigt. 25 - CHRISTMAS: A SAVIOR IS BORN! 01 - EASTER DAY... HE IS RISEN! 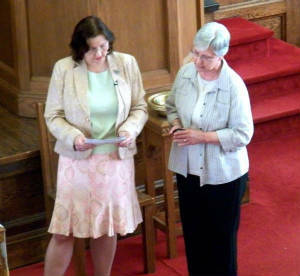 Valerie Hartling (right) receives Honorary Life Membership in Presbyterian Women. PW Ladies have lunch at Tamarack. Rev. Janice Tiedeck gives the lesson at our PW Birthday Offering Luncheon. Our Networkers: Click on picture to view more photos. 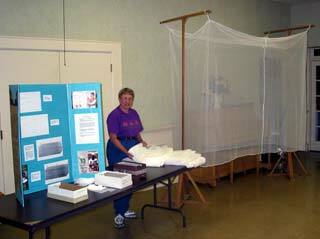 Networkers: We sewed 10 Bed Mosquito Netting kits for places where malaria is a serious problem. We will be doing it again this year. Networkers Mother's Day Cards: We responded to the need for funds to assist in the distribution of the existing stockpile of bed nets. Money collected from card sales and sent - $825. Bandage Rollers: Ladies meet regularly to roll bandages from used sheets, meeting a monthly quota as pledged to the Mission Committee of the Statewide Coordinating Team. Overseas Requests: This past year we made and sent 7 BabyBlankets, 14 Baby Gowns, 100 Rolled Bandages, and 12 Sheets, which were sent to overseas hospitals. Head Start Help: For several years the Social Issues Committee has coordinated the collection of socks & underwear as well as winter hats & mittens for Head Start children in the community. Women's Resource Center (shelter for battered women and children): We regularly help supply them with needed things such as personal items and small cash donations. The Homeless Shelter: We ocassionally donate items they are in need of. 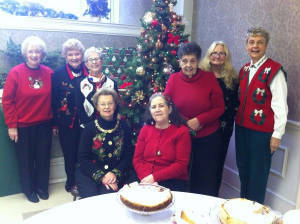 Beckley Boys Group Home: We donate Christmas Gifts and Money to this home, located on City Ave. In the past we have also helped them acquire needed things. Birthright: This Beckley non-profit organization helps needy pregnant and unwed mothers in the community. 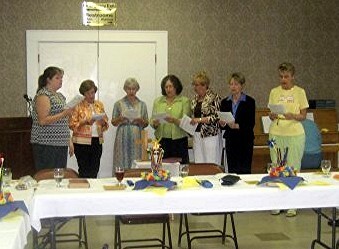 Our Presbyterian Women recently recognized them at the Thank Offering Luncheon and donated both cash and baby items for their use. 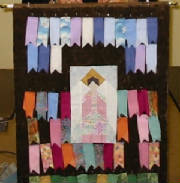 "In Memory of...": Each Circle often donates money to buy a book for the Church Library in memory of someone. Several years ago the Coordinating Team voted to make and sell cookbooks in memory of our former long-time church cook who had died. Profits from this project went to the Church Kitchen Fund for use as needed. Equal Exchange Coffee: This is a mission project to help support the poor small coffee farmers of the world (Latin America, Africa, Asia) in their effort to make a living, improve their communities and quality of life, meet medical needs, obtain childcare services, etc. despite the competition of big coffee companies. 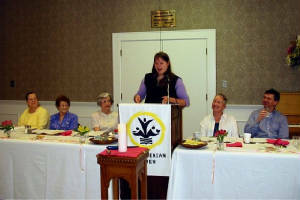 Presbyterian Women is a churchwide organization whose membership is open to all women. 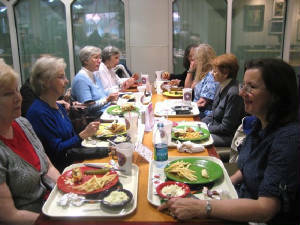 The members are women who choose to participate in or be supportive of the organization in any way. Because we believe that diversity contributes to wholeness, PW intentionally seeks the membership of women from all racial-ethnic groups, so that the organization may reflect a vision of the whole church as a community of mutual interdependence.